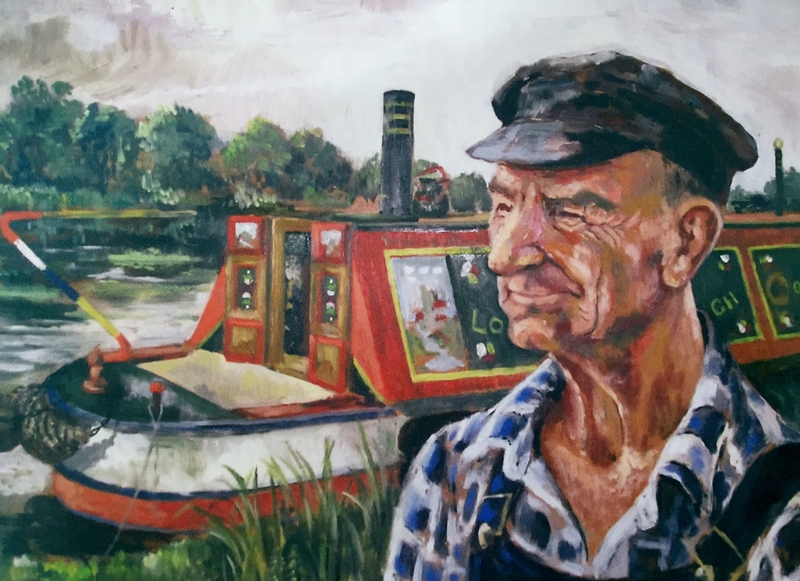 ‘Having just bought a second-hand, fibreglass canal cruiser, my husband and I were very fortunate to find a good mooring close to Bishop’s Meadow Lock in Loughborough, where we met the lock-keeper, Jack Monk. His narrowboat, ‘Owl’, was moored just between our boat and the lock. From the moment we met him I knew that I wanted to paint his portrait. His face was full of character and weathered by hard work out of doors. Very obligingly, he stood next to ‘Owl’ which I sketched in roughly as I concentrated on Jack. 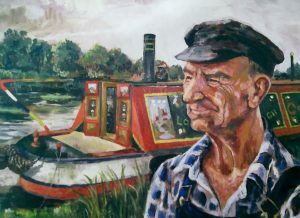 Read an article by Loughborough resident David P, himself a canal enthusiast, about the history of canals.